A more modest crew in the mess coach this time, it must be the Easter holiday that does it. 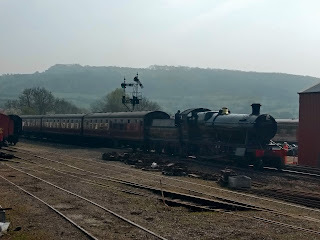 Still, it ensured well filled trains, which we liked to see. The day started grey and misty, so cold that we put our hats and coats on. 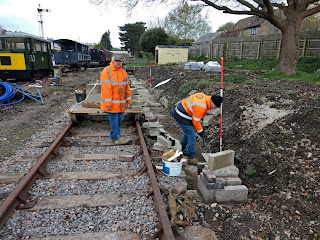 Jules and Dave P had to go off to a wartime meeting, but found the time to fetch up some more concrete blocks for us. 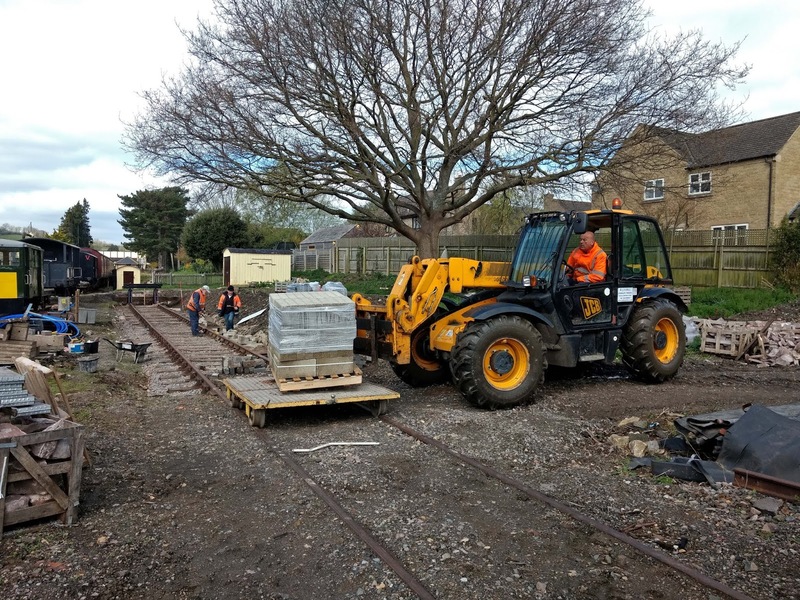 The first palletful went straight on to the Permaquip trolley, so we were able to push all these blocks down to where they were going to be laid straight away. 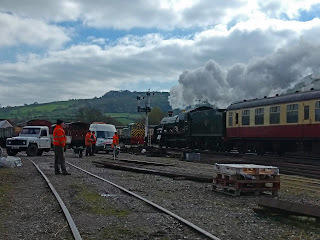 Out of the gloom came Dinmore Manor with the first train of the day, to fetch the waiting passengers at CRC. And we had only just finished chewing on our currant buns. Such luxury, currant buns and tea. Plus, extra cakes from Peter C, who has a birthday this week. Won't say no to that, some baked concoction involving sultanas and ginger, which went down very well indeed. 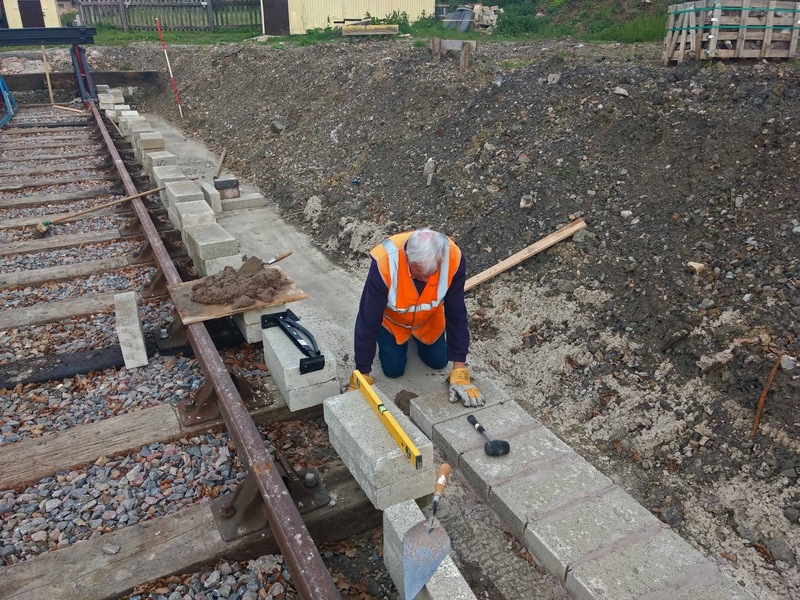 Peter B joined us in laying blocks today, and he extended the bottom row - there will be 7 or 8 of them in total. The bottom row is the worst. You are either bent right over, or working on your hands and knees, like here. 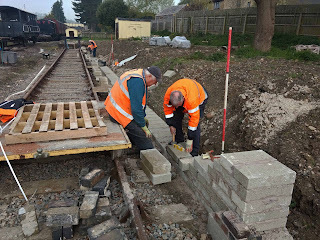 At the other end Paul was showing Neil how to lay blocks. The first row goes like this, and the second row like that, see? 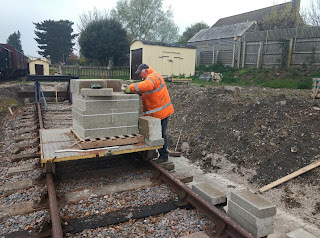 The pallet on the trolley is now empty, so that's 80 blocks laid out. 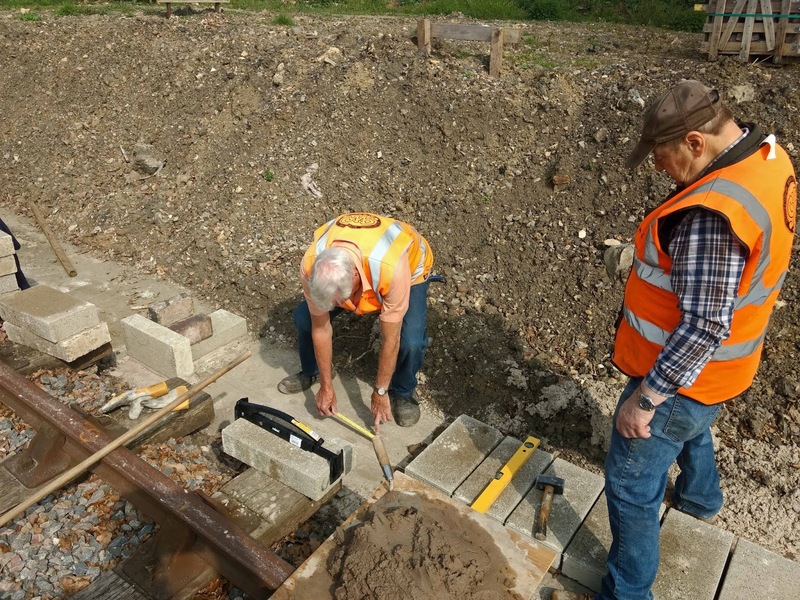 After a while Jim came down too, and showed Peter how to lay the blocks up to the next tower. 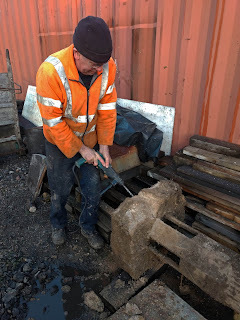 Notice the tongs that grip a block, what a handy tool that is. Peter is just measuring how many more blocks he can get in here. We were working at two levels then, with Neil and Paul at the end here, and Peter and Jim somewhere beyond the middle. One lot was on the second row, the other was extending the first. 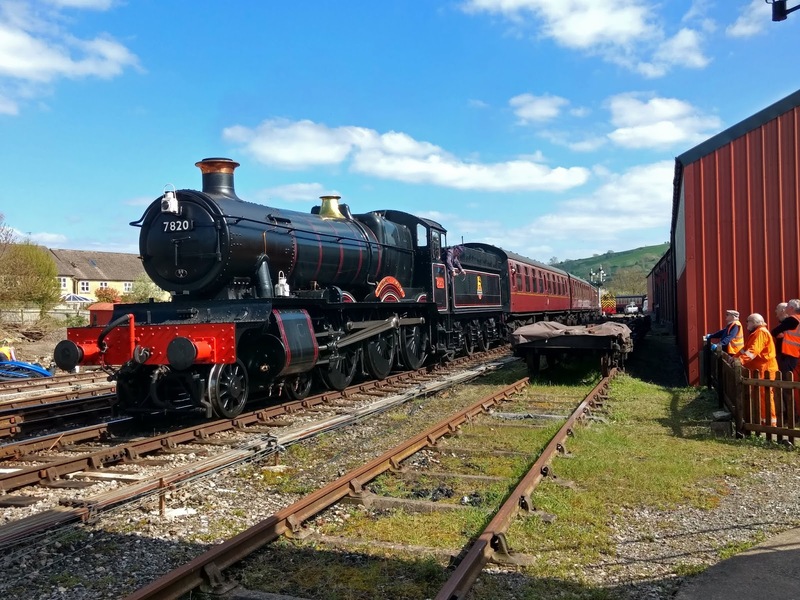 After a while second train of 8 coaches headed south - 2807 on the maroon set. Maxie the mixer was rattling away today, not feeling very well. Her belt wasn't very tight, and she kept stopping, even though we heard her rattling away. We found out what was wrong - she was smoking! Noooooo? Yes, look ! Cheeky thing, right behind the carriage shed. Punishment came swift, you have to nip such misbehaviour in the bud. Dave P gave her a thorough beating and she didn't smoke any more after that. She spat out a load of muck, and we wheeled that away happily. Lord Muck hands it out. 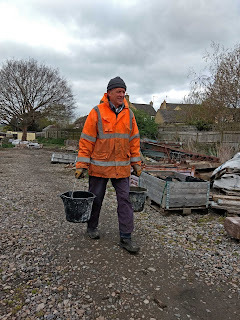 Dave took the barrow of muck down to the coal face, where Jules, back early from his meeting, was another willing taker of the creamy stuff. Now we had 3 block layers on the go. 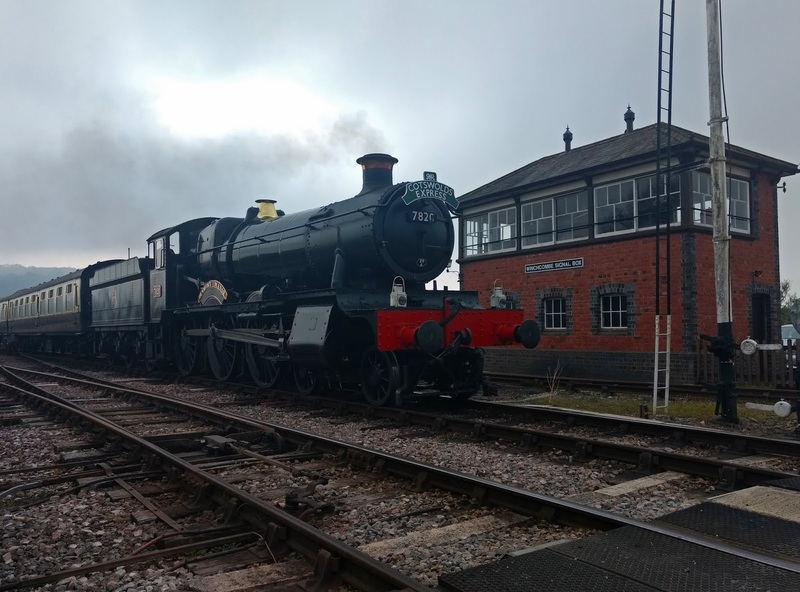 As 2807 released the route back to Toddington, Dinmore Manor emerged out of Winchcombe station and took the first train out of CRC on towards Broadway. It looked pleasingly busy, although we won't know how we are doing compared to last year until at least 3 months have passed. Opening to Broadway was very exceptional last year, and this year should be more normal. Neil was doing quite well laying the second row of blocks, so John came up with another supply of blocks, which he laid out next to Neil. In the middle Jules found the increasingly warm sunshine dried his site out, so he applied a little water along the bit he was going to cover in mortar shortly. At the southern end Jim was showing Peter how to set up another tower. 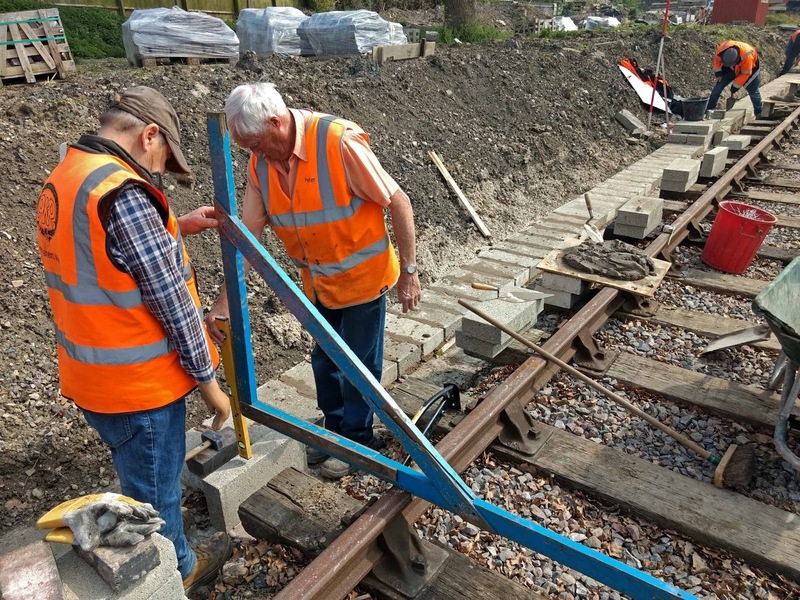 They are just checking that it is the right distance from the rails. That blue track gauge, made on the railway, is ancient. 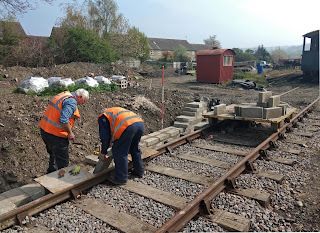 It appears in pictures 20 years ago at Cheltenham, when the track was laid in between the platforms there in 1998. 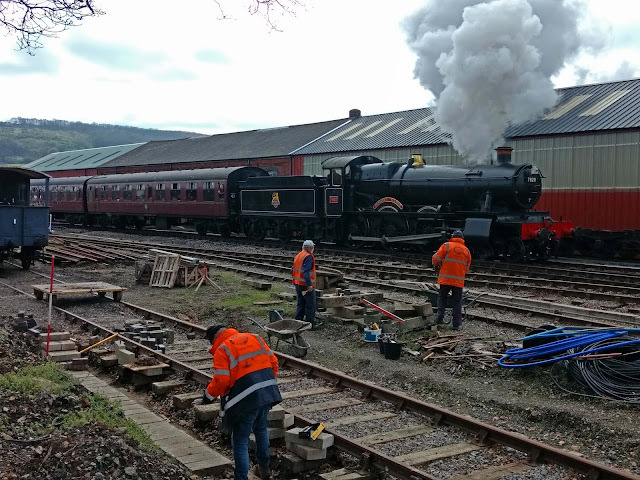 Today it is well battered, broken in two and mended with a bit of wood and some screws. Still does the job though. Several other members of the gang could be seen in training for track walking. 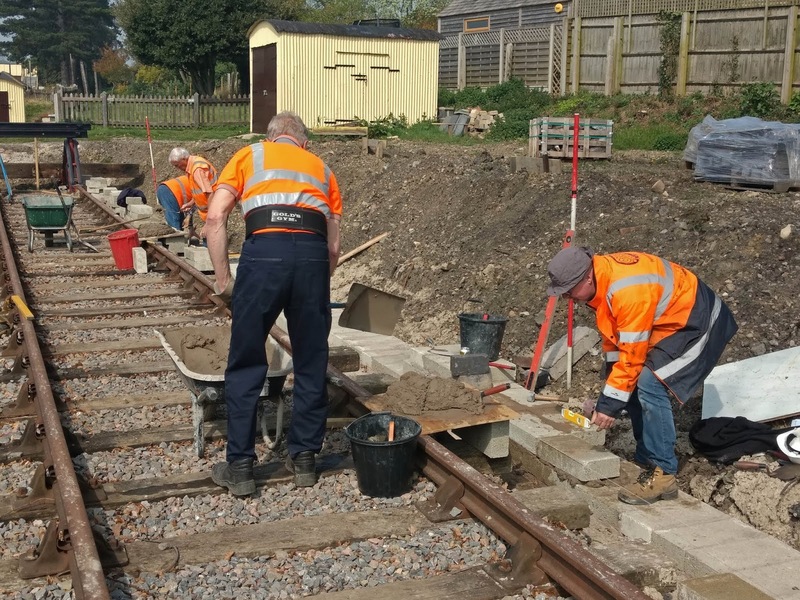 Following a reduction in the numbers, we have recruited new track walkers, and they need a period of introduction, familiarisation and learning. 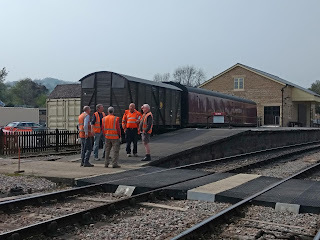 Winchcombe is a good place to watch trains crossing, and you can see both locos out today, passing each other and exchanging tokens with the signalman. Mid afternoon the heat (yes, the heat, what a change!) was getting almost oppressive, and several of us had to trot down to the Coffeepot to get lemonades for much needed refreshment. 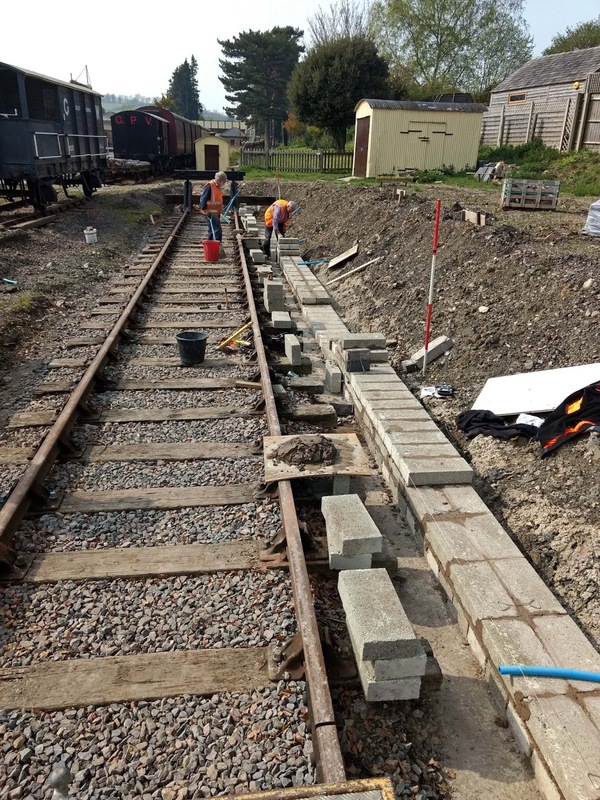 As we were wrapping up, the new 30 metre platform wall was starting to become more visible. Rows of blocks one block high, two blocks and at the northern end even three blocks high were becoming evident. The blue pipes have been cut to allow drainage from behind. 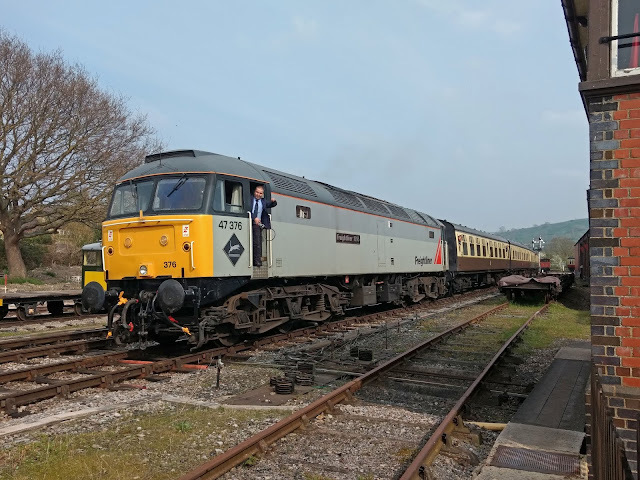 The last train of the day is diesel hauled to Cheltenham, and here it is just arriving with the class 47 in charge. One of the crew is just getting ready to exchange tokens with the signalman, who is standing on the platform behind the camera. 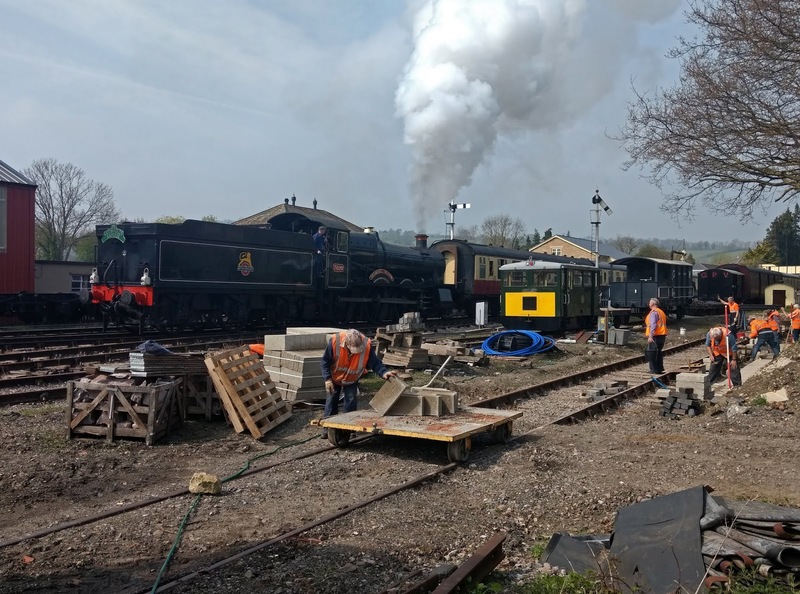 Here they are, the Toddington-Winchcombe token is being handed in, and the Winchcombe-Cheltenham one is being handed out, having been collected from the maroon set behind, which comes in first. All very slick. 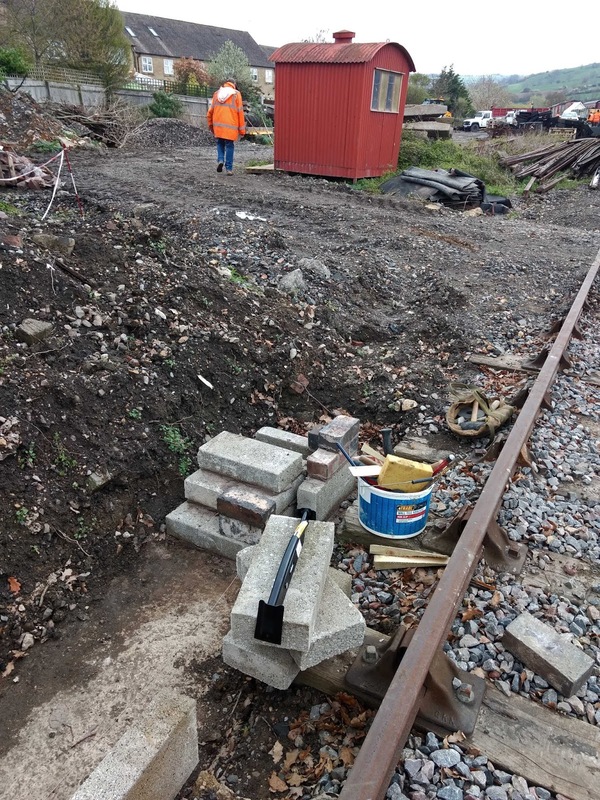 Work on the Usk weighbridge hut, or rather the platform adjacent to it started today. This forms part of the project, and the hut will stand on the patch of ground next to the platform, once back filled. We have also just received planning permission for the building, which is great news. So the project has a green light, and we threw ourselves into it today with gusto. 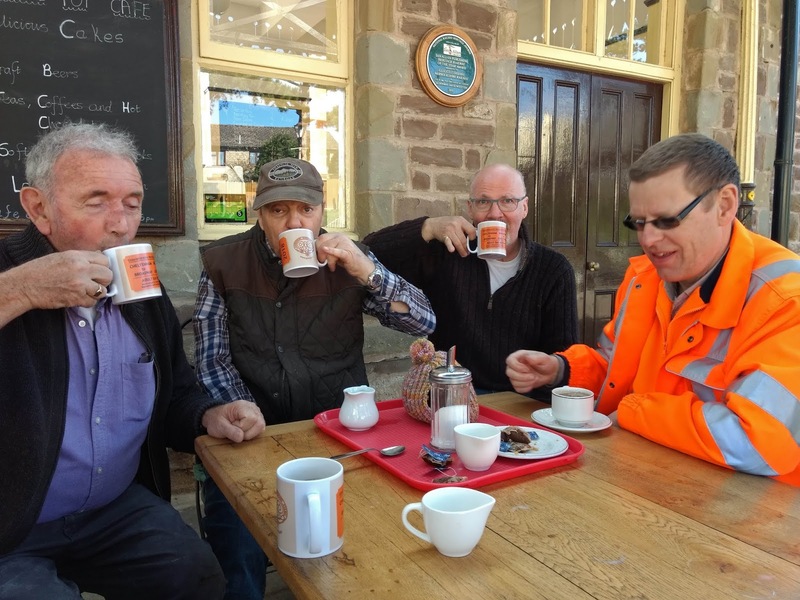 Not before tea in the mess coach though. 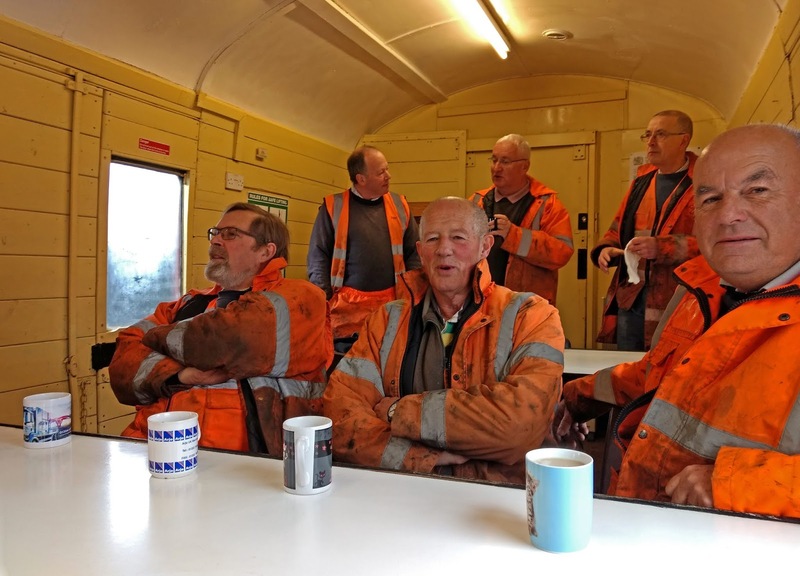 Every volunteer had a mug of it, with doughnuts galore. A milk maid brings supplies. The northern end of the new platform. The we got ourselves ready to start work. 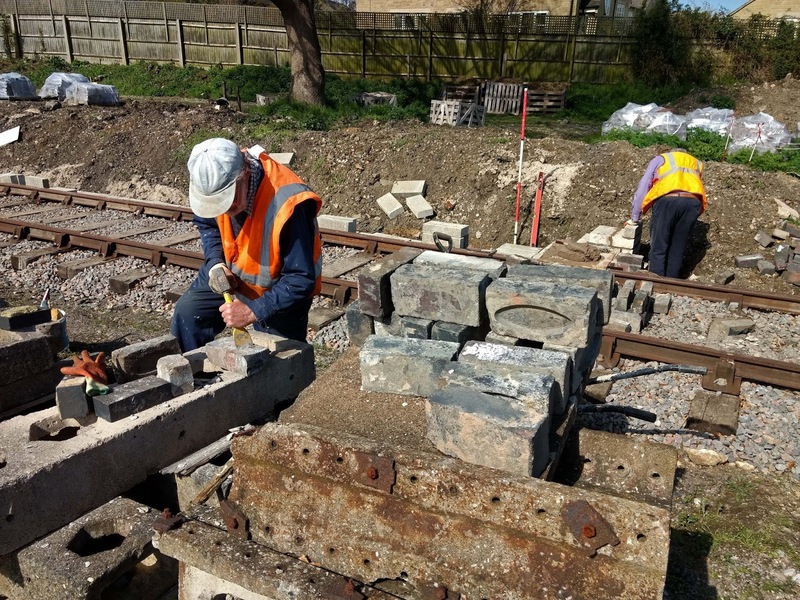 Last week, Jim and Paul set out a number of towers of blocks to mark the progress of the new platform wall along the concrete foundations. The end one then was our starting off point, with Julian laying the first blocks of the day, later helped by Paul. 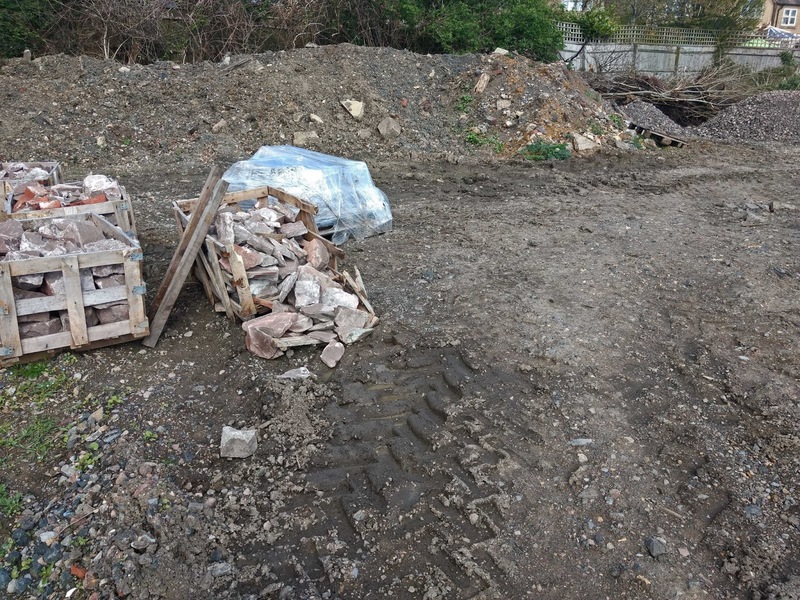 The blocks were trollied up to the site and dropped off in handy piles. Minnie the Mixer having died a battleaxe's death, we had a new volunteer mixer in Maxine the mixer, a name we soon shortened to Maxie. Maxie and Minnie, see? 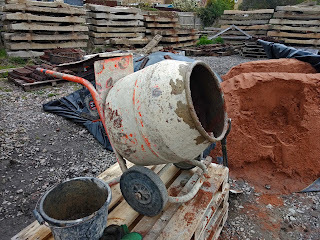 Maxie was an older mixer, with no legs to shout about, and a nasty rattle and a cough. She had seen a lot of action. On top of her cover someone had inscribed 'BAG' and we thought that was a little unfair to a lady of her age. Despite the coughs and rattles she did the job, and we were very pleased she came. The mixes produced by Maxie, some distance away as the sand couldn't be tipped any nearer, were barrowed up to the platform site and shovelled on to the two spots used by Paul and Julian. 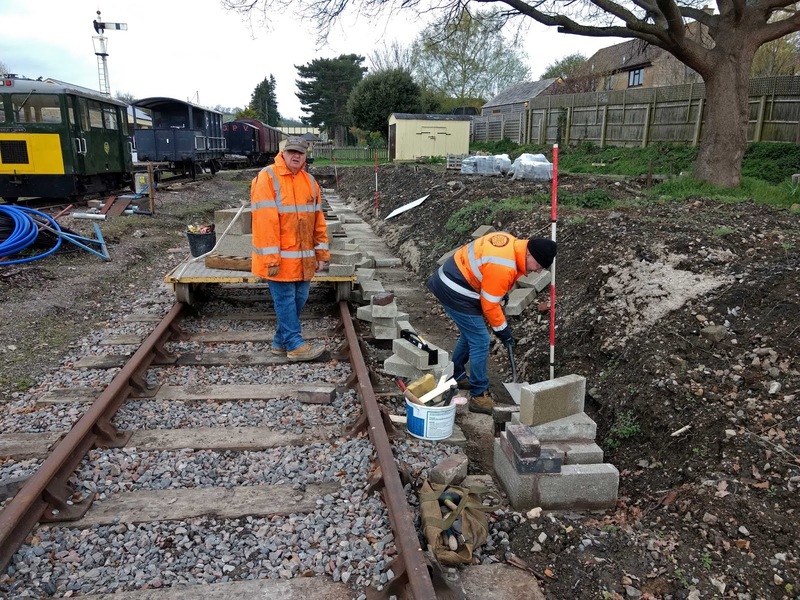 Paul here is building up the tower further, while Julian has volunteered to the backbreaking job of laying the blocks along the first row. Further along, Jim and John were also setting out, here using the very ancient gauge (it appears in John lees' historic 'Early GWSR' pctures) to establish an intermediate tower at the stop block end. The stop block will have a return built around it. 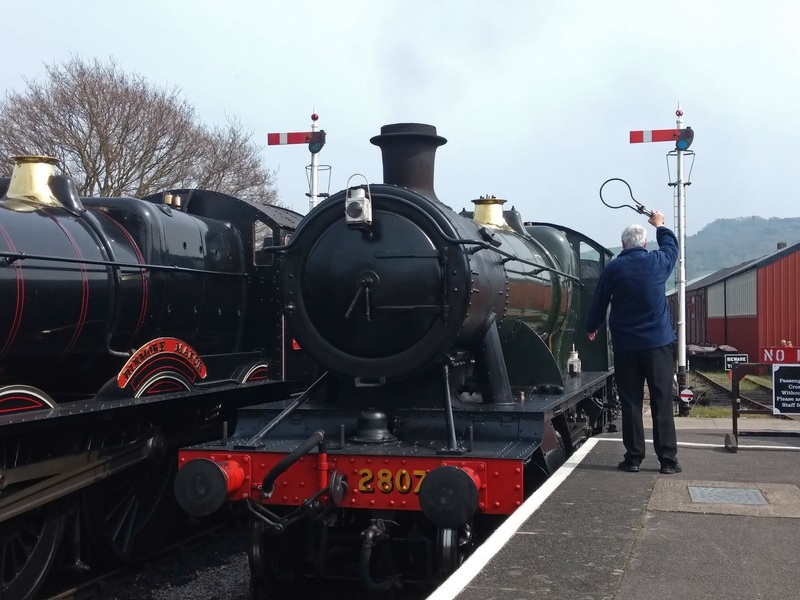 We had two steamers out today, Dinmore and Foremarke. 2807 was off sick with a hot box, incurred on Sunday. In the foreground Julian is doing well with the blocks. 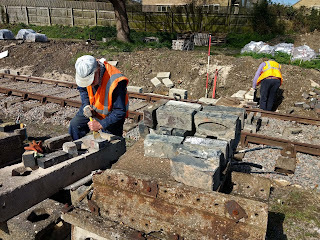 Yours truly and Dave P scouted round the yard and found quite a few blue engineering bricks, which we dropped at the start of the site. They, and others, will be used to face the platform with blues, and the blocks will be behind them. 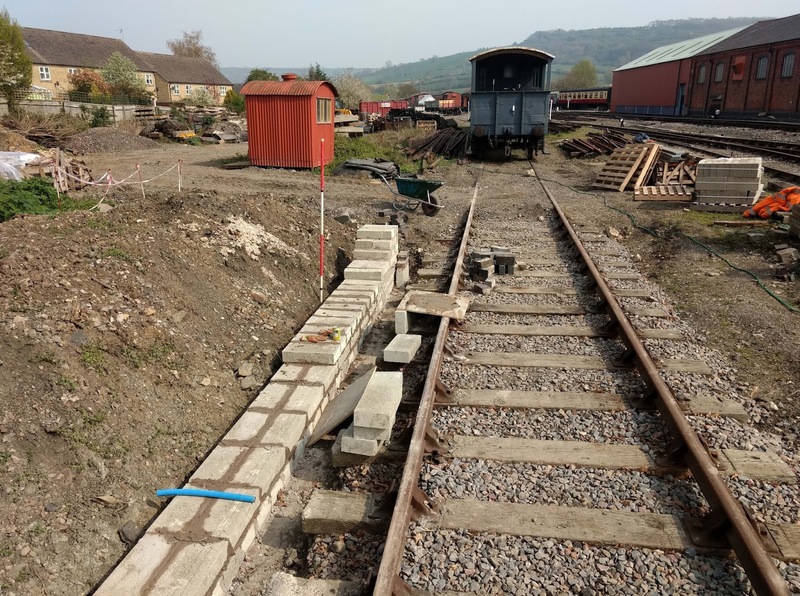 After crossing Dinmore at Winchcombe, Foremarke chugged by the yard where block laying and rail loading was taking place. 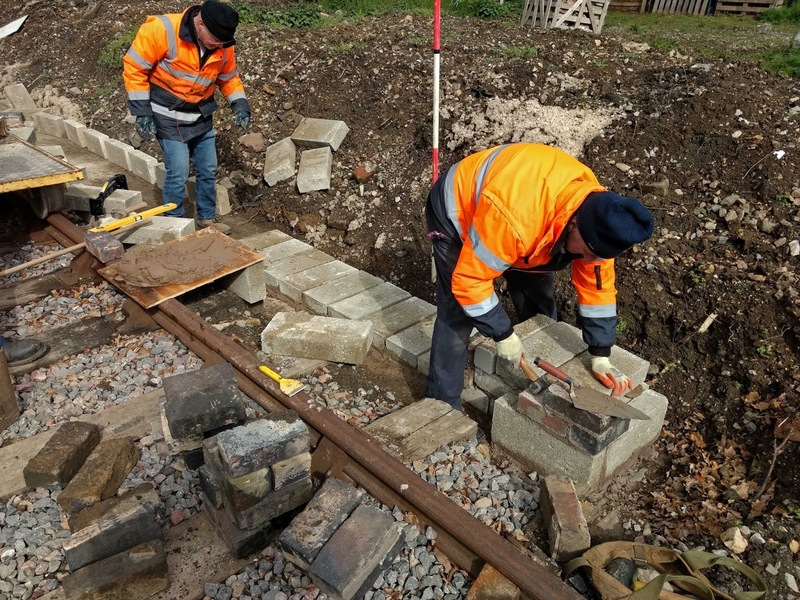 We were doing quite well with the block laying, and soon had dealt with one pallet of the things, and had to ask Martin to bring us another. With a growing pile of blues recovered from around the yard, John decided to clean them up a bit so that they could be used by the future brick layers. 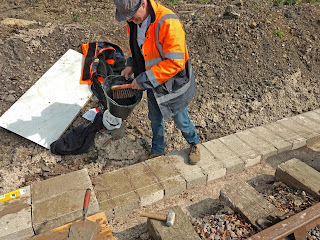 He spent most of the day doing this, the mortar on them was quite hard. 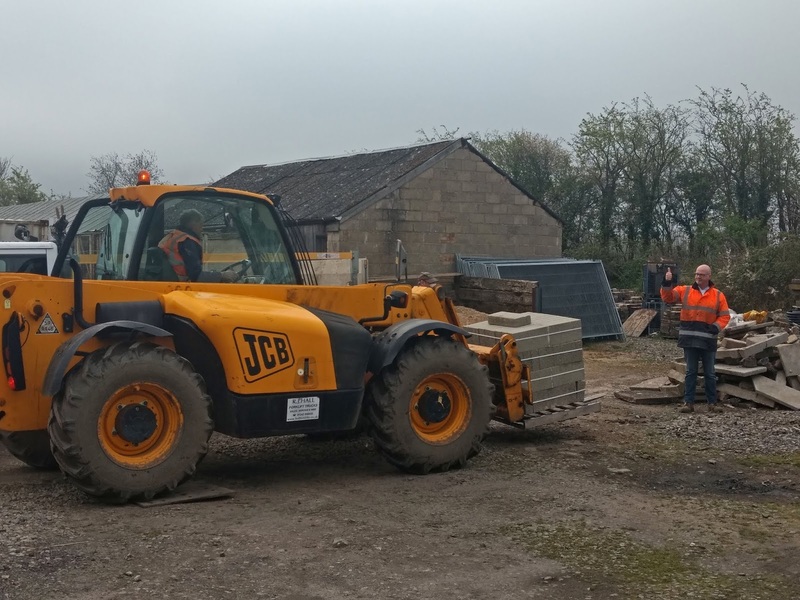 The Usk stone material pallets are scattered round the yard and someone here hasn't been very careful with the Telehandler. The culprit is unknown, luckily. But now that we have planning permission we will be able to proceed with laying them, at least once the platform is done, so they shouldn't get shunted about like this for much longer. This is an overview of the platform site. It's about 30m long. 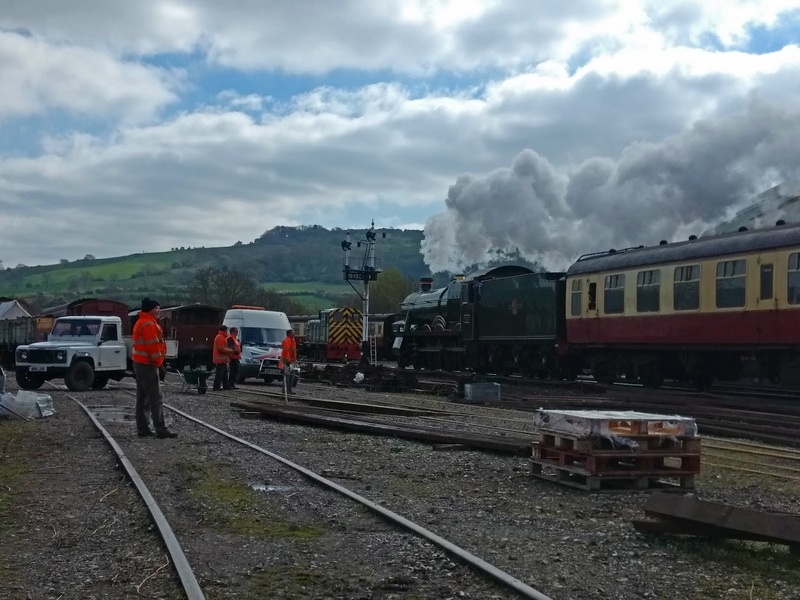 Later in the afternoon Dinmore Manor came by, and members of the C&W team came out to have a look as she drifted by. 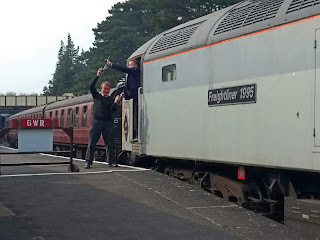 The fireman has the token ready for exchange with the bobby, who is standing behind the camera. And here is the token exchange actually happening. It's half term at the moment, so there were several children on the train. One had his back to the window, headphones on, and was playing with an Ipad. Well, you can't please everybody. We also noticed that the mess coach had received visitors since the weekend, as they had opened the fridge and smashed the eggs that were in it. Well, that could have been worse. We shall have to take away the ladder leading to the door for a while. Mid afternoon Julian was beyond the half way point. 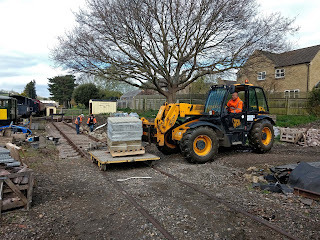 Blocks were getting scarce, and with the Telehandler in use elsewhere in the yard we couldn't fetch any more form the other side. Here is our end of the day shot, late afternoon. 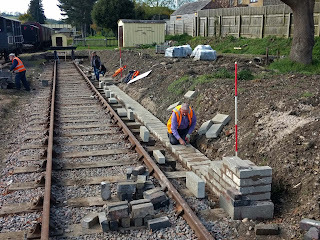 Paul is just pointing the gaps between the blocks, while Julian has laid his last block in the distance, about two thirds of the way down. The blocks will be at least 6 courses high. This depends on the size of the big blue engineering bullnoses that we are going to put on the top (rather than slabs as per passenger platforms) and we have secured a supply of these from Tyseley, who were sellers. Laying blocks is pretty back breaking, so we decided to afford ourselves a mug of tea in the Coffee Pot at the end of the day. 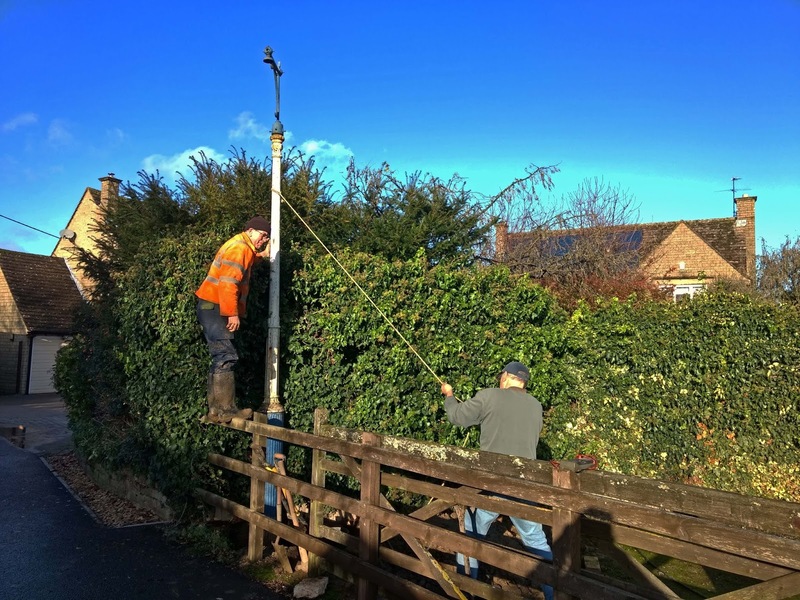 Today was the day 3 heritage minded volunteers went to dig out the GWR yard lamp at 'a village near Evesham' as described in the auction catalogue. 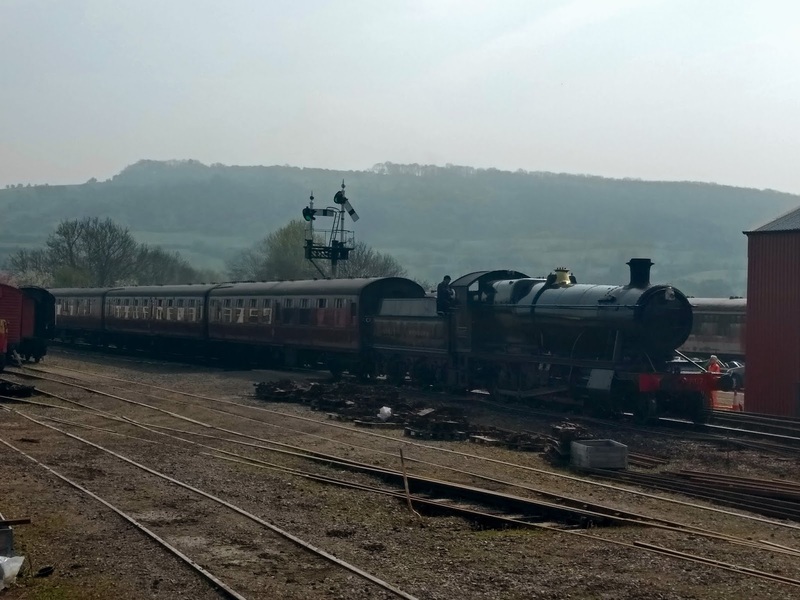 This turned out to be Dumbleton, just down the road from us. Great! The first volunteer, John, was already on site and had started digging the hole. 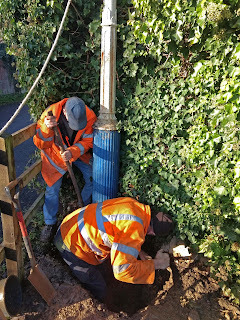 The post was positioned rather awkwardly - for a dig - right in a corner up against a fence, so we could not dig a hole right round it. 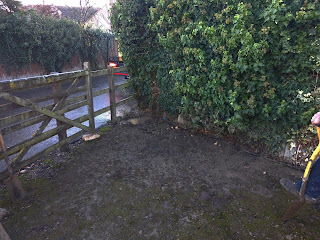 But every cloud has a silver lining, the access for the lorry was brilliant, hard standing right next to it. So that was a box ticked. 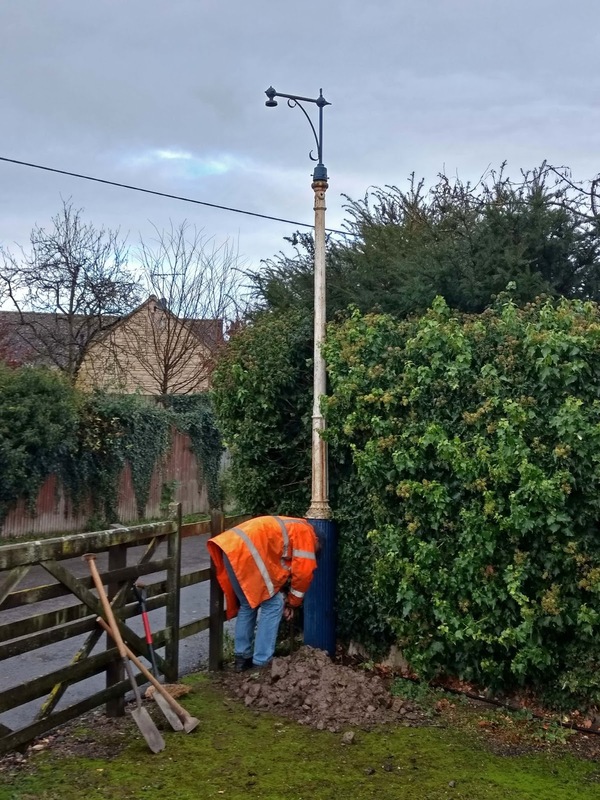 As you can see, the post has a later light fitting, but one which is still period GWR. 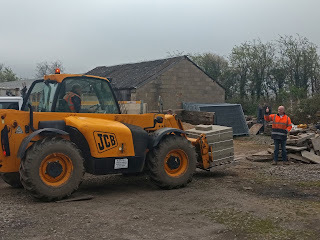 By the time Neal (you must now realise that we are talking about the canopy/footsteps team here) had arrived, the digger was standing in an annoying pool of water. 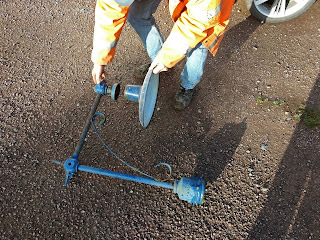 This worsened when we revealed the slots in the bottom of the post, as this released a whoosh of water from inside. 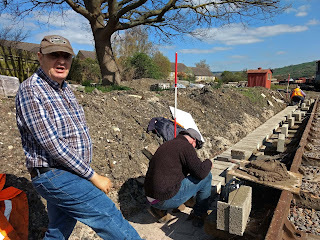 John and yours truly really hadn't reckoned with working in a pool of water so wore normal steel toe capped boots, but Neal, bless him, had brought wellies, so he was immediately promoted to chief digger. It took almost two hours to get to near the bottom of the post. We borrowed a plastic flowerpot from a neighbour to bail out the water, but more arrived almost immediately. But by lunch time we had dug deep enough for a trial wobble. Without success too. 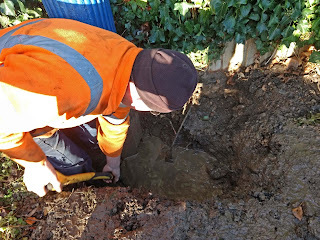 More digging was required though, particularly round the tricky back, which was hard up against the fence. 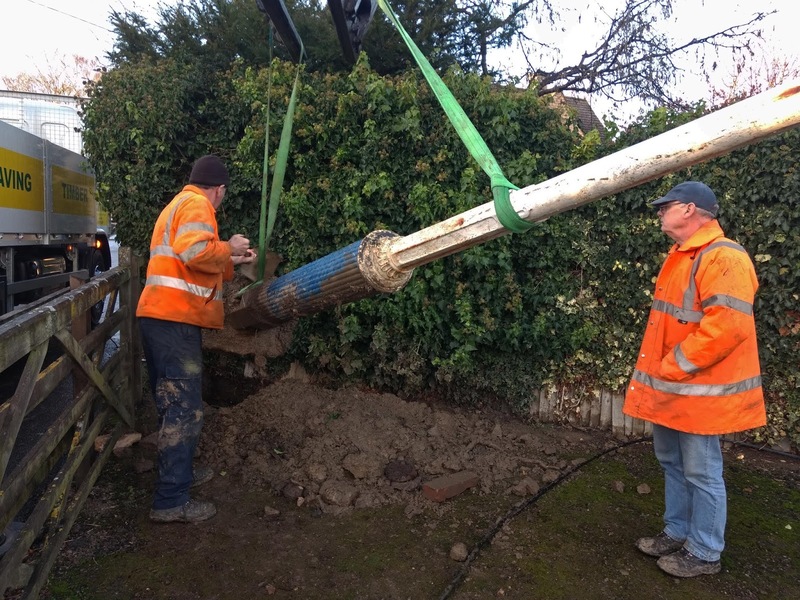 We knew the base was 2'6'' deep, but those who planted it made a deeper hole than that and included 6'' of fluting, which made us have to dig three feet down. 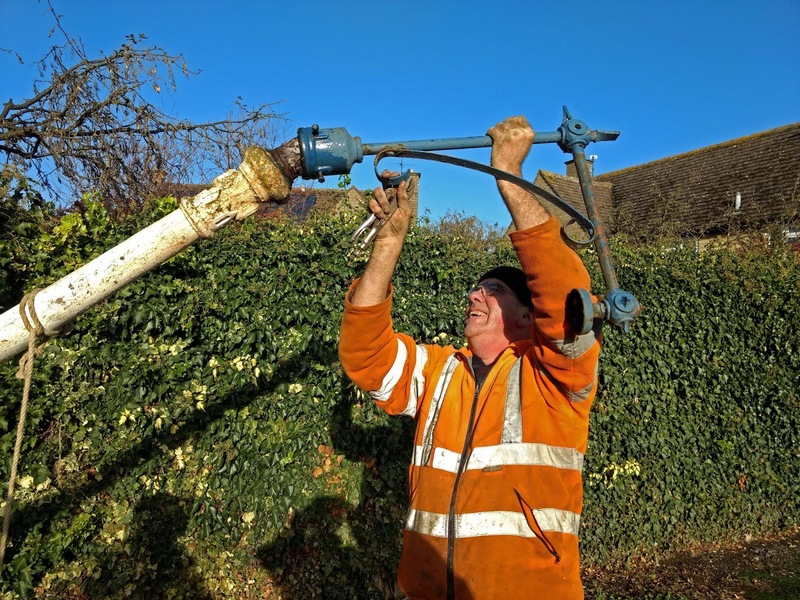 Neal had a special narrow spade called a grafter, and this proved ideal to excavate a narrow channel round the rear. 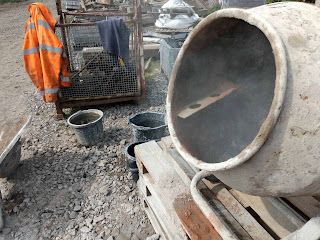 Then we had a second go at giving it a wobble. It did seem to give a tiny bit. Encouraged, John and then your blogger heaved and released that rope repeatedly, until at last some visible movement became apparent. Oh joy! 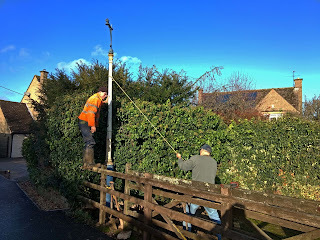 Gradually, by heaving and releasing, we were able to work the tall post to and fro, until it began to take on a pleasingly alarming angle. Once it was down far enough, held up by the edge of the hole, we were able to take off the lighting bracket that was on top. 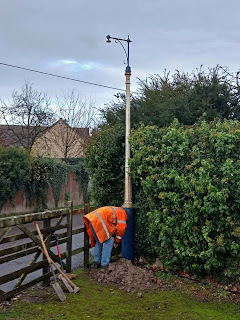 This is a standard GWR fitting, we heard, but you could see from the remains of some sheared off bolts further down the post that this was indeed once a proper yard lamp with steps and platform. 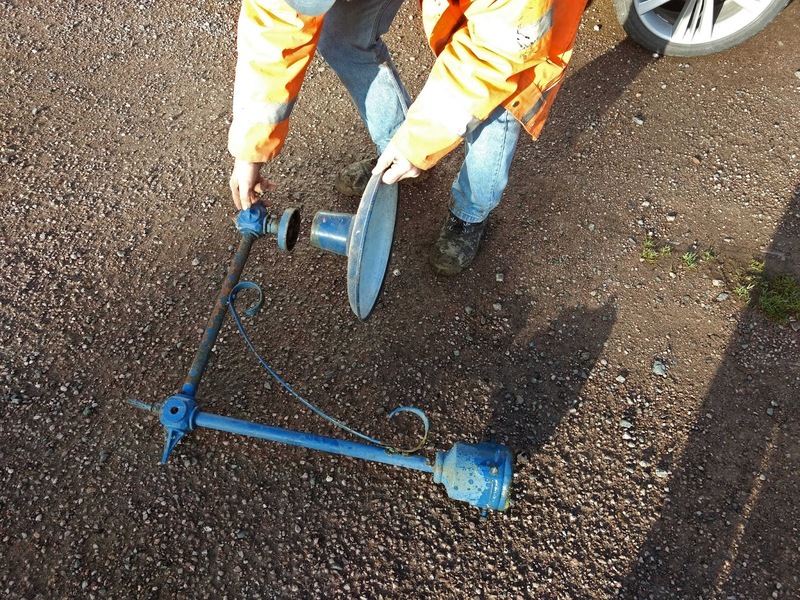 This is the fitting we retrieved, together with a lamp shade provided by the owner. 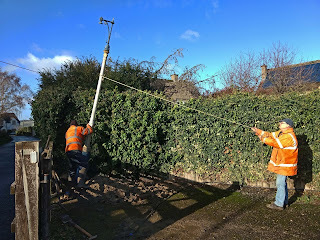 Sadly there was no one after the very many years this post was on site who could tell us from whence it came, nor when. Malvern Road, Gloucester perhaps? A friendly neighbour then came over and asked if we would like any tea? Would we indeed! Yes please. We were exhausted after all the digging in the muddy water. 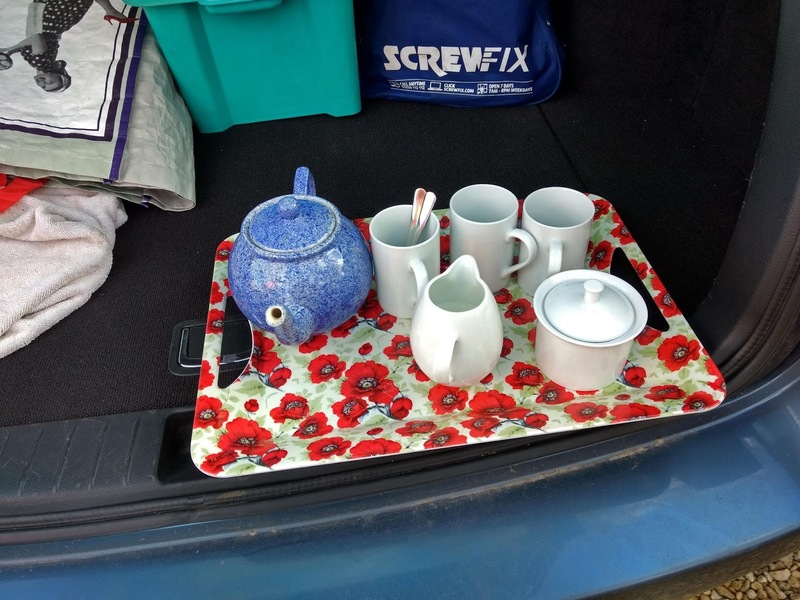 We didn't get 3 mugs of tea, we got a whole tea service, brought to us on a tray and served in the back of his car nearby. Heaven. The neighbour turned out to be a member and while people felt sorry that the old post was being dug up, they were pleased to hear that it was going to a good home, where the new owners would reinstate it with its ladder, platform and a new replica copper lamp top. 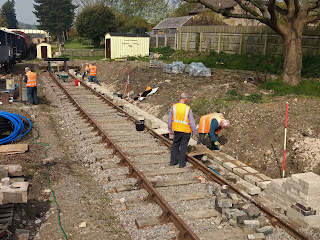 While waiting for the lorry to arrive we had a brief excursion back to Toddington for lunch, and there we found the freshly galvanised footsteps, already back after just 2 days. Great service. The lorry we needed came from Honeybourne company Fairview, who we think deserve a plug for their friendly service and willingness to help. 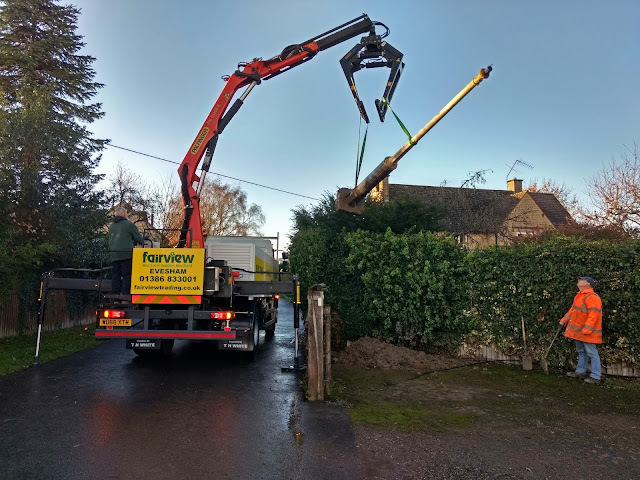 Fairview sent their largest lorry - we needed at least a 16 foot bed - and this also had a powerful HIAB on the back. Neal paused the lift in order to clean off the worst of the dirt still clinging to the post. 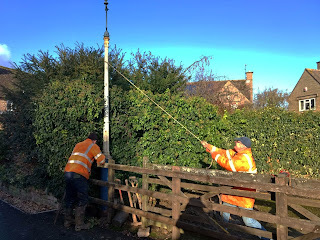 The 16 foot post was lifted easily. It was such a relief to see it finally up in the air. We have dug out a few posts now, and they are all different, you never know how they were put into the ground and what is underneath. This one had a concrete block round the base, but luckily it was only a small one, determined by a little test dig we did a few days earlier. 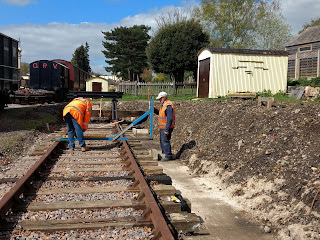 If you follow the GWR drawing, these tall posts should be bolted down to a substantial concrete block underneath. 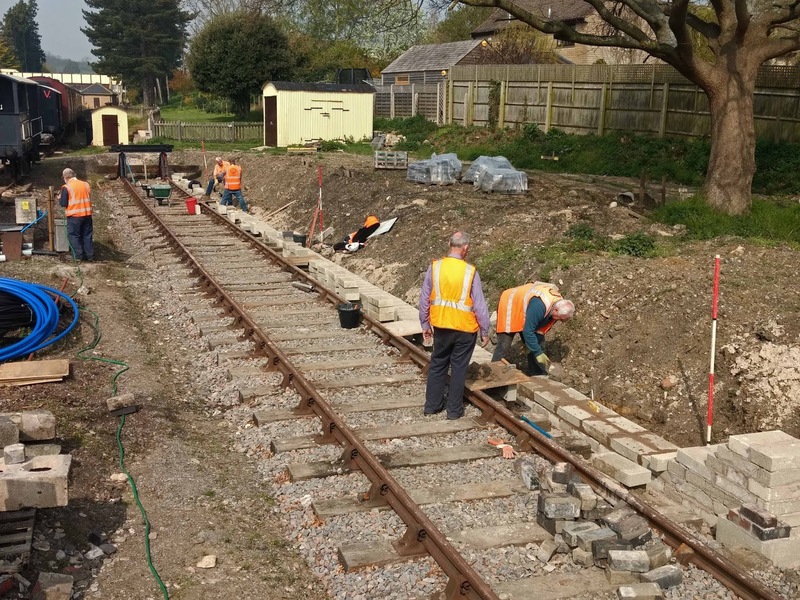 Luckily, in this case the new owners hadn't read the GWR book. 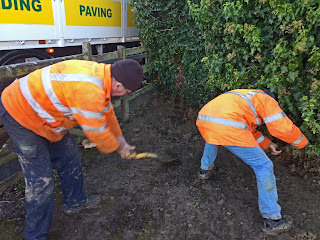 We asked lorry driver Dave to wait for a few minutes while we back filled the hole again as best we could. We left the site neat and tidy, later putting a pallet we found on top, as there was still a small dip remaining, the post and its concrete block now being absent. Then it was off to Toddington in convoy. Here we dropped the post off by the entrance to the shed in an unobtrusive spot. 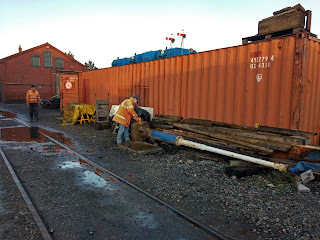 This will allow us to clean it up and measure it for the new ladder and platform we are going to make. 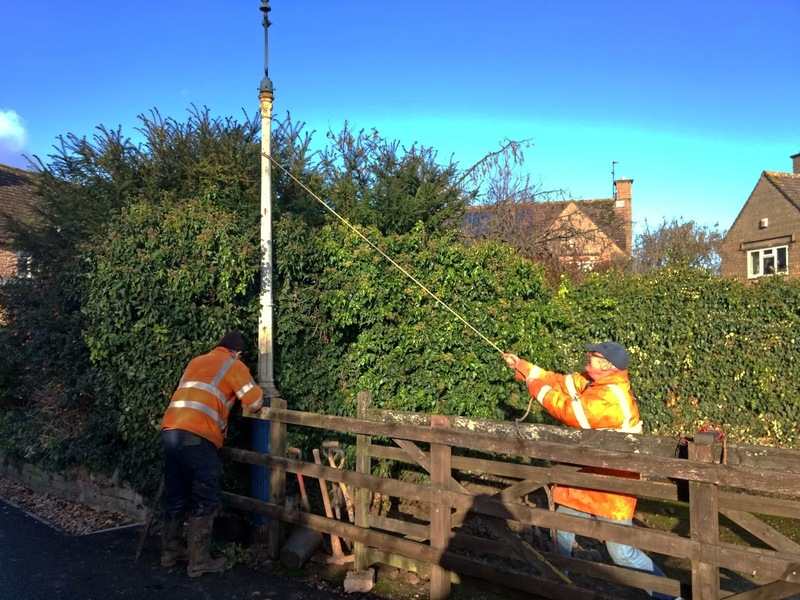 We need the post to be within striking distance of an electrical supply, so that it can be worked on. We are very lucky that we have another yard lamp, already restored by the loco lads, inside the shed, and this one is equipped with its original ladder and platform. We have been told that this is quite a rarity. 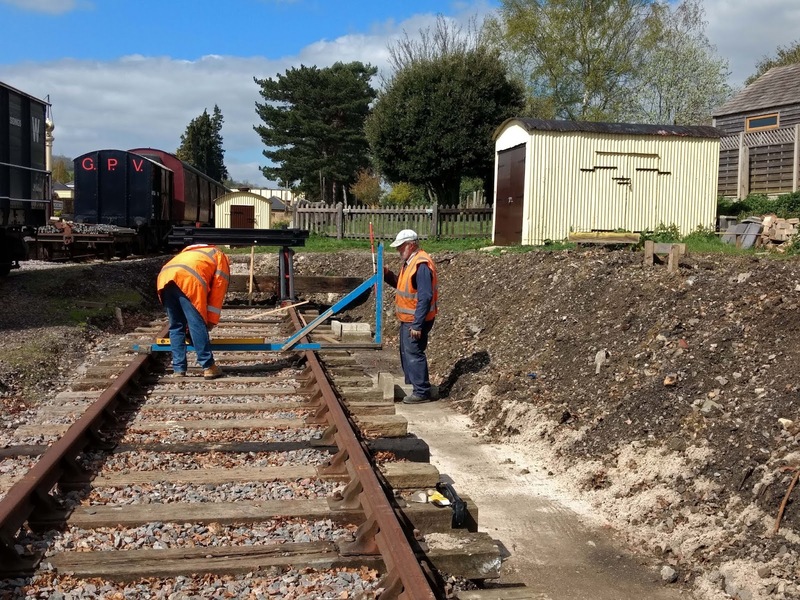 With a sample nearby, we should be able to fabricate a new ladder and platform for the Dumbleton post. As to its future location, we see it in the loco yard somewhere a little ahead of the lorry in the picture above, to the side of its twin, which will be situated in front of the water tower. 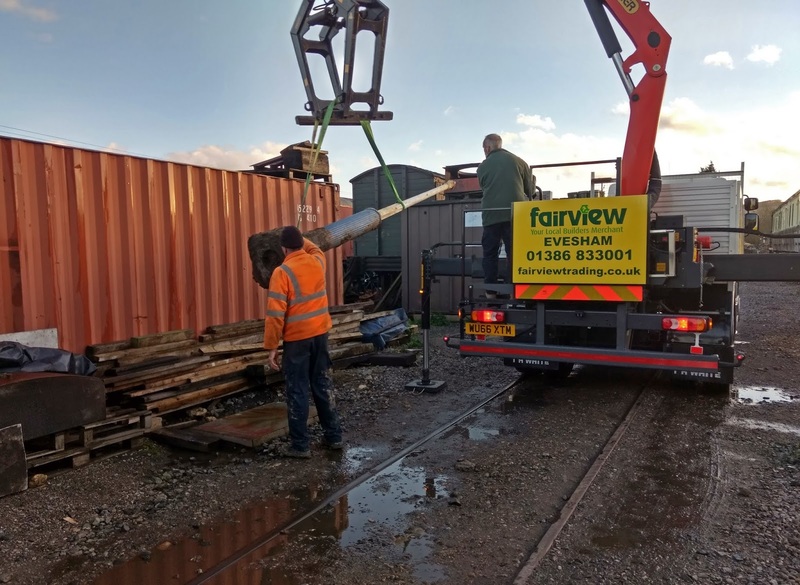 That will give the loco yard a very authentic pair of GWR yard lamps, and a great chance to take photographs of GWR locos in their natural shed environment. Here is the post, parked in its temporary location. 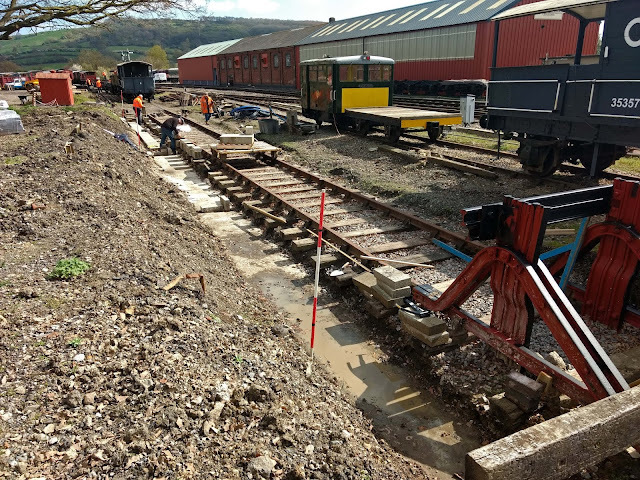 John has started work on removing the concrete jacket at the foot of it. 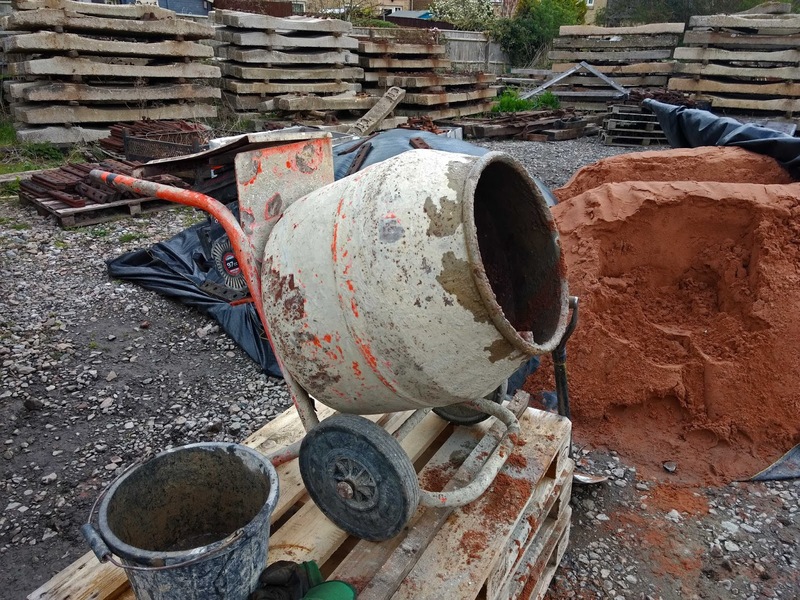 Unfortunately the people at Dumbleton were not acquainted with the idea of 'weak mix' and this lump was made of hard, solid concrete. 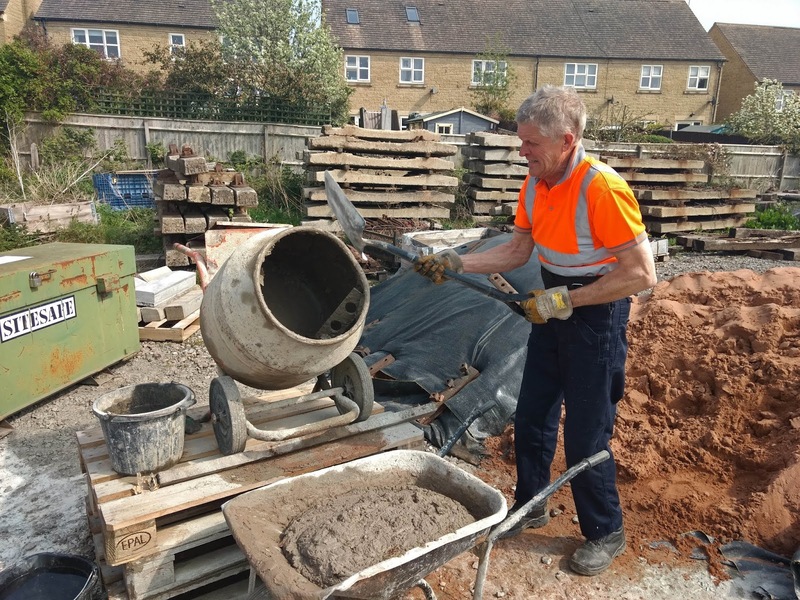 On the left here, Neal has got out his trusty SDS drill and is giving that hard concrete a bit of bother. 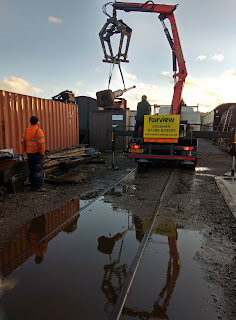 We did get it all off in the end, but it was getting very cold and dark at the time. 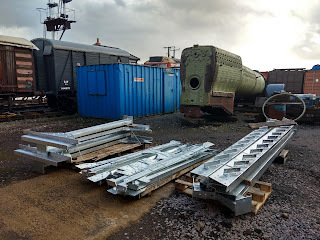 On the right is a GWR yard lamp with its original ladder and platform. 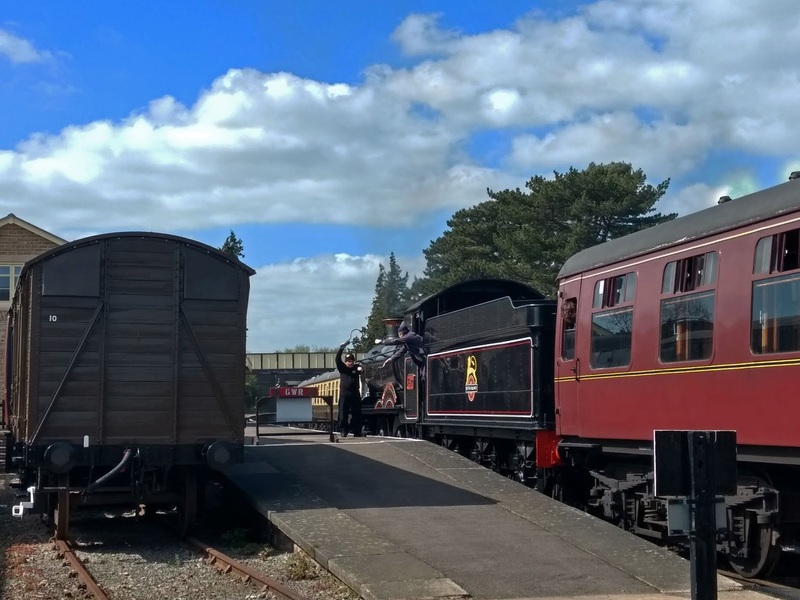 That one is at Gotherington. We are at an advanced stage with a specialist in designing two new lamp tops. These will be given to the manufacturer who made the Broadway canopy lamps. Once they are complete, the loco department will dig in both posts in front of the shed. Something to look forward to, wouldn't you say?